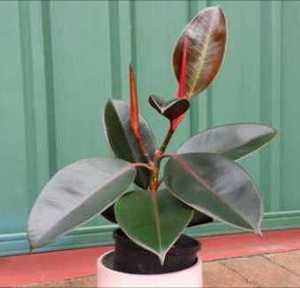 Rubber plant (Ficus Elastica) is a popular indoor house plant. Their leaves are very attractive. If you wish your rubber tree to have a vertical look, then do not prune it. Slim and tall rubber plants are good for rooms with high ceiling. But if you prefer a lower bushy look, then you should prune it. You can prune a rubber plant to give it a desired shape. A bushy rubber plant looks good on a table or table shelf. Rubber tree plants gets large if not pruned in order to control their size. Pruning a rubber tree plant is simple and quite easy. Continue reading below to learn how to prune a rubber tree plant to remove unwanted parts of the plant and make it bushy.The pruning of the rubber plant will confine your rubber plant in a pot or in ground to a lower height but thick and bushy. If you want your rubber plant to remain tall and thin, prune only when necessary. If you do not cut the top end of your rubber plant, it will continue to grow and become too big. I never pruned my rubber tree plant so it reached to the 12 feet high ceiling and then it turned sideways. Sharp pruning shears or garden cutter. Wash with soap and diluted bleach. A pair of gloves. You should wear the gloves when pruning the rubber tree because the plant will ooze out white sap. This sap is irritating on the skin. wash your hand if you accidentally touch the sap. Dead leaves and branches can be pruned at any time. Best time to prune a rubber tree plant is from spring to summer, when the plant is actively growing. I have pruned my rubber plant in a different season, but it did not harm the plant. The only difference was that the new growth did not occur until the next summer. Cut the main trunk or stem at a lower height, just above a node. A node is a point where the leaves are attached to the stem. The branches need not to be cut at an angle. The pruning will make the rubber tree branch out. Two or more branches will grow at the cut end. The pruning will force side shoots on the plant. The picture on the left shows that two side branches have grown at the point where the plant was pruned. Prune again after the new branches grow two new sets of leaves (side shoots). each of the two branches will now two or more new branches. This way the plant will become thick, growing both in width and height. Continue pruning each branch after the growth of two new sets of leaves. Over-pruning the plant will reduce the number of leaves on the plant, so it will affect the photosynthesize and may die. If your rubber plant is small, leave at least 2-3 leaves behind. In a larger rubber tree, you can remove up to 4 branches at a time, leaving 6-10 leaves behind. If you see root coming out from the holes at the bottom of the pot, re-pot your plant in a pot of next size, 1 inch larger in height. The picture below shows a bushy and dense rubber tree plant. This rubber plant was pruned and trimmed at correct place and correct time. Use the cuttings, which you remove from your plant to grow new rubber plants (how to grow rubber plant from cuttings) .